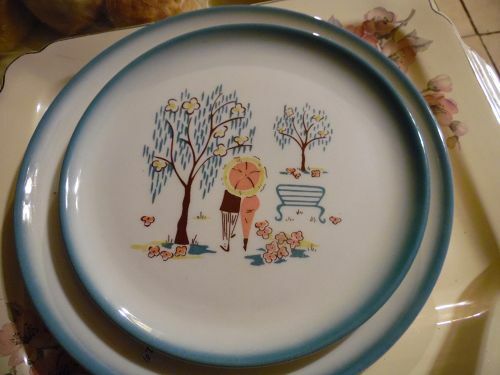 Brock of California Forever Yours salad luncheon plate 9"
Nice 9" salad or luncheon plate Brock of California, pattern is a creamy bas, willow in the park print that has aqua blue accent rims in an ombré fade. “Forever Yours” is the name of the pattern. Ceramic Dinner Plate is Mid Century 40s 50s no chips or cracks no use marks at all . 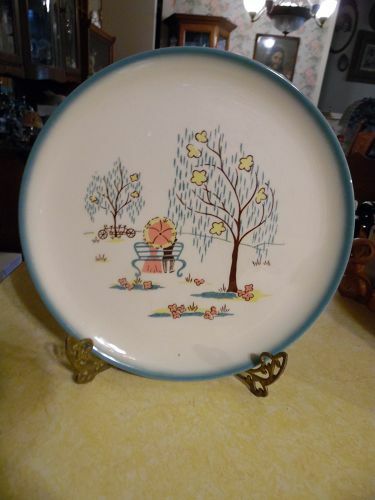 Brock of California Forever Yours dinner plate 11"
Large dinner plate 11" Brock of California, pattern is a creamy base willow in the park print that has aqua blue accent rims in an ombré fade. “Forever Yours” is the name of the pattern. Ceramic Dinner Plate is Mid Century 40s 50s no chips or cracks no use marks at all .